U.S. Ambassador to the United Nations Nikki Haley on Tuesday said President Donald Trump would be justified if he denied Iranian compliance to the nuclear accord when it comes up for a quarterly review next month, though she said she does not know what Trump will decide. In a speech at the American Enterprise Institute think tank in Washington, D.C., Haley detailed a strong case for Trump to declare Iran in violation of the agreement, warning the United States will be "dealing with the next North Korea" if the regime is left unchecked. "We're allowing them to have behavior that's in violation of the resolution right in front of us," she said. "We're allowing them to sit there and actually tell the [International Atomic Energy Agency] that they're not going to let them inspect military sites where we know they have had covert nuclear operations in the past. What I want the country to understand is we need to wake up." Haley said if Trump chooses to declare Iran in violation, it would not automatically trigger a U.S. withdrawal from the accord. Instead, she said the decision to leave the accord would be tossed to Congress, leaving room for lawmakers to keep in place U.S. sanctions relief. The Trump administration has been weighing since April whether to scrap the deal, despite disagreement from U.S. allies in Europe who helped implement the agreement two years ago. Haley acknowledged European objections, but added: "This is about U.S. national security. This is not about European security." She said the international community's unwillingness to challenge regime behavior "for fear of damaging the nuclear agreement" typifies the threat the deal poses to American national security, describing it as "too big to fail." U.S. law requires the president to notify Congress every 90 days on whether Iran is adhering to the accord, which aimed to limit Tehran's nuclear activities in exchange for the lifting of sanctions related to the program. The Trump administration has twice recertified the agreement, though Trump warned in July he would not continue to do so indefinitely. The next recertification deadline is in October. 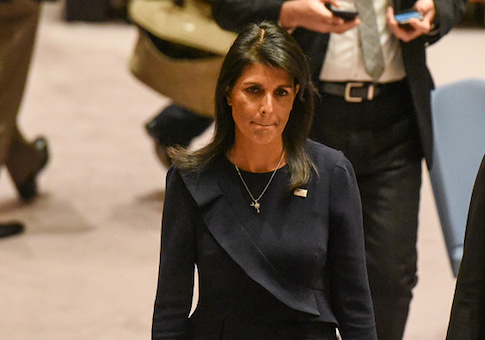 Haley said she would not predict the president's decision, but suggested repercussions if Iran continues to deny the IAEA access to its military sites to ensure Tehran's compliance to the accord. "If the president finds that he cannot certify Iranian compliance, it would be a message to Congress that the administration believes either that Iran is in violation of the deal, or that the lifting of sanctions against Iran is not appropriate and proportional to the regime’s behavior, or that the lifting of sanctions is not in the U.S. national security interest, or any combination of the three," she said. Haley traveled to Vienna last week to pressure UN atomic watchdogs to check Iran's undeclared military sites to verify it is not concealing activities barred by the deal. This entry was posted in National Security and tagged Iran, Nikki Haley, Nuclear Weapons, Sanctions, Trump Administration. Bookmark the permalink. Natalie Johnson is a staff writer at the Washington Free Beacon. Prior to joining the Free Beacon, she was a news reporter at the Daily Signal. Johnson’s work has been featured in outlets such as Newsweek, Fox News and Drudge Report. She graduated from James Madison University in 2015 with a B.A. in political science and journalism. She can be reached at johnson@freebeacon.com. Her twitter handle is @nataliejohnsonn.